The Washington Monument dominates the center of the neighborhood. 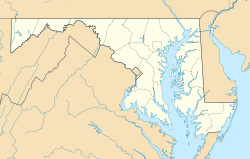 Mount Vernon is a neighborhood immediately north of downtown Baltimore, Maryland. Designated a National Historic Landmark District and a city Cultural District, it is one of the city's oldest neighborhoods and originally was home to the city's most wealthy and fashionable families. The name derives from the Mount Vernon home of George Washington; the original Washington Monument, a massive pillar commenced in 1815 to commemorate the first president of the United States, is the defining feature of the neighborhood. The Baltimore City Planning Commission defines the neighborhood as being bound by Eager Street to the North, The Jones Falls Expressway (JFX) to the east, Franklin Street to the South, and Eutaw Street to the West. The Commission also considers the northern section to be the Midtown-Belvedere neighborhood after the Belvidere estate of John Eager Howard, the Revolutionary War patriot. The Inner Harbor is about half a mile south of Centre Street. Being close to downtown, Mount Vernon is well-served by public transit. Many area major bus routes head through the neighborhood on their way to the financial district including the Purple Line of Charm City Circulator which runs through Mt. Vernon northbound on Charles Street and southbound on St. Paul Street. The Light Rail line runs along Howard Street on the west edge of the neighborhood, and the Metro Subway runs beneath Eutaw Street a block west of that; both have stations within easy walking distance of the neighborhood. Penn Station, served by Amtrak and MARC commuter rail, is also one block to the north past Mount Royal Avenue and over the JFX. Although mainly residential, Mount Vernon-Belvedere is home to a mix of institutions, including the Peabody Conservatory of the Johns Hopkins University, Walters Art Museum, University of Baltimore, Maryland Historical Society, Contemporary Museum, Maryland Institute College of Art, Joseph Meyerhoff Symphony Hall, Baltimore School for the Arts, Lyric Opera House, Center Stage, Enoch Pratt Free Library Central Branch, Spotlighters Theatre, the Eubie Blake National Jazz Institute, and the Peabody Bookshop and Beer Stube (demolished 1997). In the decades after World War II, the neighborhood has also become home to many professional service providers, including medical and legal offices, publishing firms, architectural firms, insurance and financial institutions, and fund managers. Art galleries, retail stores, hotels, and bed and breakfasts (B&Bs) also populate the neighborhood, and Mount Vernon has a rich nightlife, with a variety of restaurants, cafes, and bars located along N Charles Street and throughout the neighborhood. During the 1970s, Mount Vernon began to form into a gay village for Baltimore with the establishment of the Gay and Lesbian Community Center of Baltimore (GLCCB) in 1977. LGBT milestones included the first Pride parade in 1975, and the creation of the GLCCB Health Clinic in 1980. The centerpiece of the Mount Vernon neighborhood, the cruciform arrangement of parks surrounding the Washington monument, represent one of the nation's first examples of city planning for the express purpose of highlighting a monument. The Washington Monument was completed in 1829 to a design by Robert Mills, and in 1831 the Howard family was granted permission to lay out the surrounding parks. The parks are now lined by stately homes. The parks, which have survived almost intact, are considered to be the finest existing urban landscapes by the Beaux-Arts architectural firm of Carrere & Hastings, who also designed the New York Public Library, portions of the U.S. Capitol in Washington, D.C., and the residence that houses the Frick Collection. Elsewhere in the neighborhood are many older apartment buildings and three- and four-story rowhouses; most of the latter were originally single-family dwellings. Though many have been broken up into multiple apartments, a growing number are being restored back to single family use. The historic beaux-arts Belvedere Hotel, opened in 1903, was converted to condominiums in 1991. On the northeast corner of Washington's monument sits the Mount Vernon Place United Methodist Church. Conceived as a cathedral of Methodism, it was built on the site of the Charles Howard mansion – the house in which Francis Scott Key died. The southeast corner is occupied entirely by buildings comprising the Peabody Institute, and the southwest corner includes three buildings forming the Walters Art Museum. The Stafford Hotel, built in Mount Vernon in 1894, now serves as an apartment building for students at Johns Hopkins University. The old Mount Vernon Hotel, built in 1847, was the mansion home of U.S. Congressman William Julian Albert (1816–1879) where he entertained Abraham Lincoln. Later the house was converted into a hotel (1867) and was where Oscar Wilde stayed as part of his 1882 lecture tour of America. The building is extant at 702 Cathedral Street, in the district. A portion of the neighborhood, mainly to the west and south of the Washington Monument, was designated a National Historic Landmark District on November 11, 1971, for the significance in architecture and landscape planning. It is included within the Baltimore National Heritage Area. As of the census of 2000,[not in citation given] there were 4,520 people residing in the neighborhood. The racial makeup of Mount Vernon was 55.3% White, 33.4% African American, 0.2% Native American, 7.4% Asian, 1.2% from other races, and 2.3% from two or more races. Hispanic or Latino of any race were 3.1% of the population. 60.4% of the population were employed, 3.5% were unemployed, and 36.0% were not in the labor force, a reflection in part of the student population. The median household income was $21,225. About 15.2% of families and 26.9% of the population were below the poverty line. 5.6% of occupied housing units were owner-occupied. 10.2% of housing units were vacant. Public schools are operated by the Baltimore City Public School System. This includes the Baltimore School for the Arts on Cathedral Avenue. In 2010 Baltimore Leadership School for Young Women (BLSYW), a charter secondary school for girls, moved into its permanent campus, the former headquarters of the Greater Baltimore Young Women's Christian Association (YWCA) in Mount Vernon. The BLSYW was the first newly established public school in that area in three decades. ^ "Medfield neighborhood in Baltimore, Maryland (MD), 21211 detailed profile". City-Data.com. Advameg, Inc. Retrieved 12 April 2018. ^ a b "Our History". The GLCCB. The Gay, Lesbian, Bisexual and Transgender Community Center of Baltimore and Central Maryland. Retrieved 12 April 2018. ^ a b c Parish, Mrs. Preston (February 1972). "National Register of Historic Places Registration: Mt. Vernon Place Historic District" (PDF). Maryland Historical Trust. Retrieved 2016-03-01. ^ Rienzi, Greg (July 19, 2004). "Mt. Vernon: 96 Apts, Peabody View". The Gazette. Johns Hopkins University. ^ "Oscar Wilde's 1882 Lecture Tour of America". Oscar Wilde in America. John Cooper. 2013. 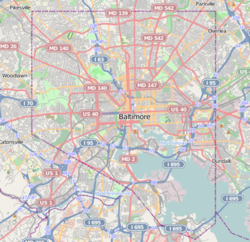 ^ "Baltimore National Heritage Area Map" (PDF). City of Baltimore. June 2010. Archived from the original (PDF) on May 22, 2013. Retrieved March 11, 2012. ^ a b c "Community Facts". American FactFinder. United States Census Bureau. Retrieved January 31, 2008. ^ Green, Erica L. (September 28, 2010). "All-girls' school moves into former YWCA building". Baltimore Sun. Retrieved March 8, 2017. Wikimedia Commons has media related to Mount Vernon Place. Wikivoyage has a travel guide for Mount Vernon (Baltimore).